The summer is a time when most people are staying up late, keeping the midnight oil burning, or in the modern world, keeping the lights on all night. Having the lights on at all hours can use a lot of electricity. In fact, standard incandescent bulbs are an enormous energy sink. The brighter the bulb, the more energy it uses. Naturally, this became less of an issue with the more energy efficient fluorescent lighting that became available on the market about a decade ago. Even more energy efficient are LED lights, but this form of lighting hasn't caught on as well as fluorescents. Just recently a company called SWITCH, has announced a new model of LED bulbs that will produce a more even and consistent light. These bulbs are also shaped more like standard light bulbs found in most homes, apartments, and bayside condos. 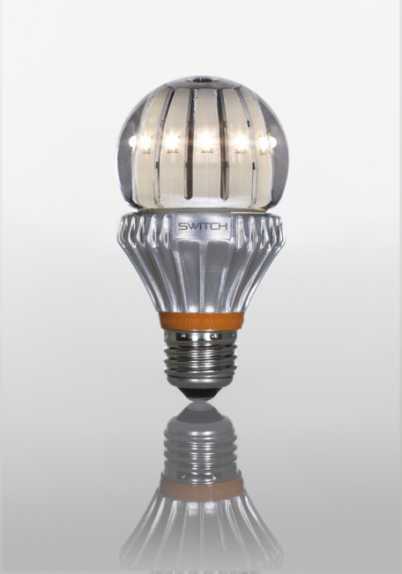 Switch Lighting hopes that the familiar bulb shape and the consistent light produced by these new bulbs will draw in lots customers. The lighting effect produced by these bulbs is achieved via a unique liquid-cooled design. Liquid fills the inside of the glass bulb and circulates around the lit LED chips that are placed in the bulb. The LED chips in other lights are placed in the base of the light closer to the heat sink out of necessity. These tiny LED lights can product a lot of heat. A liquid-cooled design allows the LEDs to be placed up in the center of the glass and facing out into the room. This allows more light to leave the bulb in an even and consistent manner. No longer will people have to deal with the focused beam of an LED. Currently, these bulbs are being developed for commercial use. Switch Lighting expects to be able to release the bulbs this summer. The bulbs are going to be replacements for 40-watt, 60-watt, and 75-watt incandescent lamp bulbs. Hotels, retail stores and businesses with exposed lighting fixtures will be able to utilize these bulbs. They more closely resemble the standard incandescent bulb, produce better light and they help cut down on lighting costs. As a commercial product, these bulbs are more expensive at between $40 and $50 a pop. An LED bulb for consumer use is planned for release next year. Those looking to really increase their energy efficiency can look forward to the incredibly long-life and bright light from an LED bulb in their lamps.